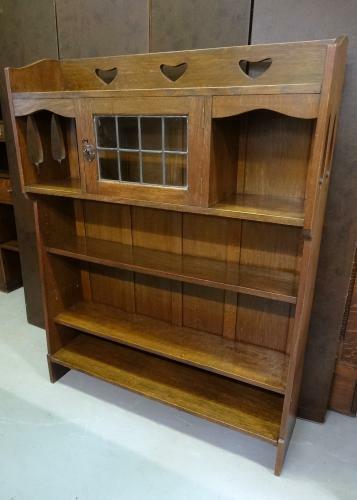 Superb Arts & Crafts oak Liberty bookcase of tapering form, with Voyseyesque eloganted tree cut-outs/piercings; a rarely seen design. Small glazed cupboard to centre section flanked by open recessess; the whole above open shelving with two adjustable and one fixed lower shelves. Heart cut-outs to top gallery. NB: the ring pull part of the handle is missing but handle still easily openable/grab-able. Approx 42" wide, 54" high and 11" deep.